Questions: This part essentially tests for the various grounds that can lead to a naturalization application being denied. Any “yes” answer should be carefully explained, and the wisdom of filing the N-400 at all, given the possible result of removal rather than naturalization, should be seriously considered. Any “No” answer to the oath’s requirements requires careful consideration and explanation. One of the main requirements to be naturalized is a person must be of a good moral character and committed to the constitution and principles of the United States. You must answer these questions carefully. If you answer ‘Yes’ to any question, make sure to consult an immigration attorney. You will need to attach your written explanation and any additional information or documentation that helps explain your answer. Answering ‘Yes’ to any of these questions may negatively affect your eligibility for citizenship. Note: You must answer all questions honestly. 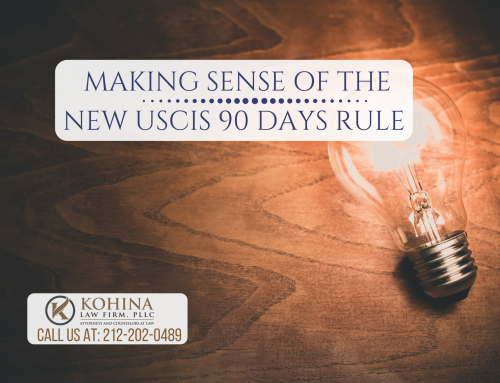 USCIS any untruthful answer, even if you think it is meaningless, may result in a denial of your application. It may even bar you from applying for any immigration benefits in the future. Part 12 questions 1-3: The immigration consequences of falsely claiming U.S. citizenship or voting in an election (even just registering to vote) in the United States are severe and can make you deportable. Only U.S. citizens can register and vote in national or local elections. 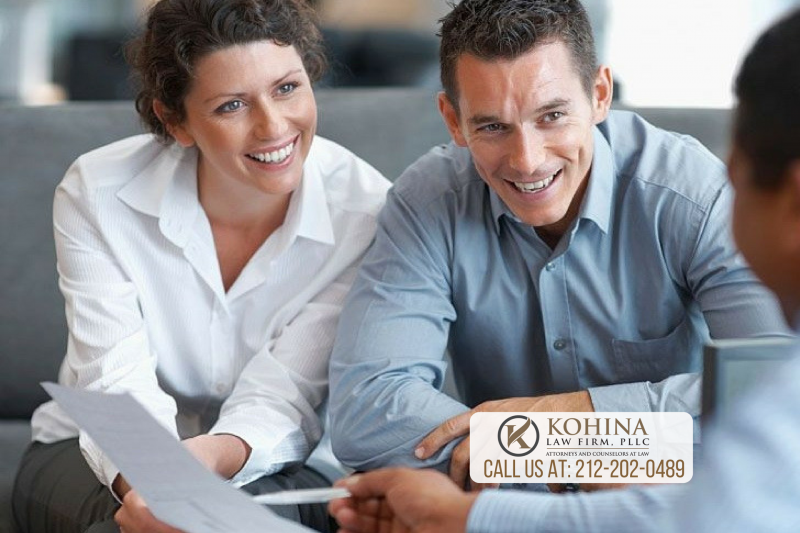 Speak with an immigration attorney if you are concerned any of these questions apply to you. 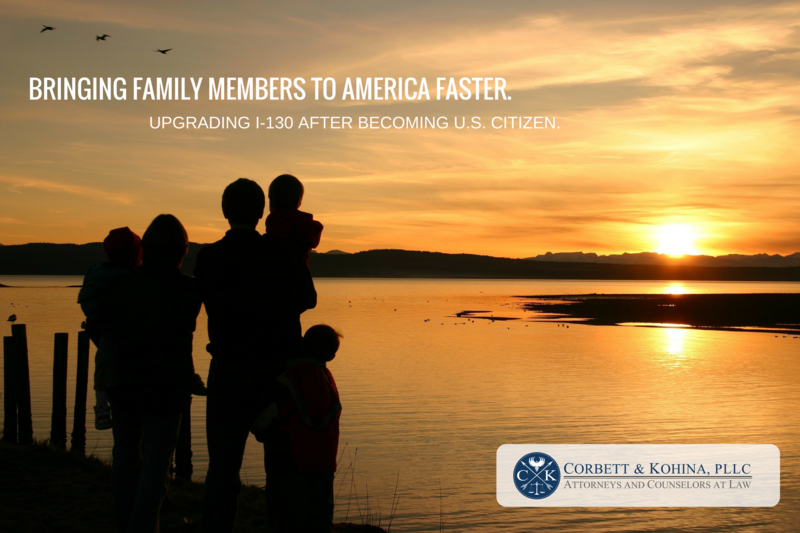 Part 12 question 4: A title of nobility is considered incompatible with U.S. citizenship. If you hold any such title it must be renounced prior to becoming a U.S. citizen. Part 12 questions 6-8 Paying taxes is one of the factors USCIS uses to determine good moral character. Although there is no specific rule that failure to pay one’s taxes makes you a person of bad moral character, the officer is permitted to deny your application if you owe back taxes. If you do owe taxes, you need to set up a payment plan if possible, as quickly as possible, and establish a history of paying your monthly payments on time and without default. At the interview USCIS will want to see a signed agreement from the Internal Revenue Service (IRS) showing that you have filed a tax return and arranged to pay the taxes you owe, and documentation from the IRS showing the status of your repayment program. If you were required to file a federal tax return but failed to do so, your naturalization application will be denied. Many people are not required to file tax returns because their income is less than the amount for which filing is required. For more information about whether this applies to you, visit www.irs.gov/filing. 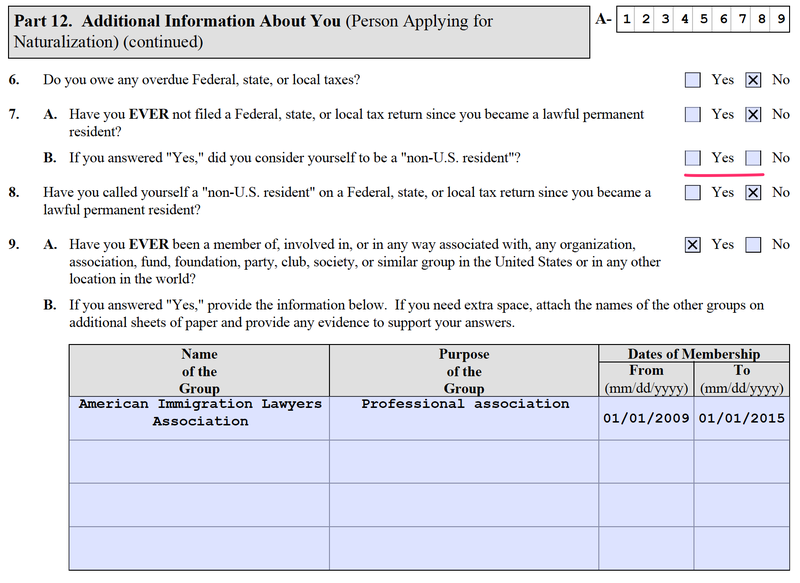 Do not be afraid to answer ‘Yes’ to Question 7A if you did not file tax returns because you were not required to. You must provide a written explanation with your application. Part 12 question 9: While only membership in Communist, totalitarian, terrorist, or criminal organizations would normally cause problems, the alien should indicate all memberships and associations (i.e., even soccer clubs, school organizations, church, etc.) in order to show that the question was taken seriously. If you have never been a member or had any affiliation with organizations mentioned in Question 9A, you should answer ‘No’. If you answered ‘Yes’ then in Question 9B write the names of the organizations that you have ever been a member of or associated with, including religious, social, and athletic clubs. List the purpose of each group and the dates of membership or association with each group as best as you can remember. 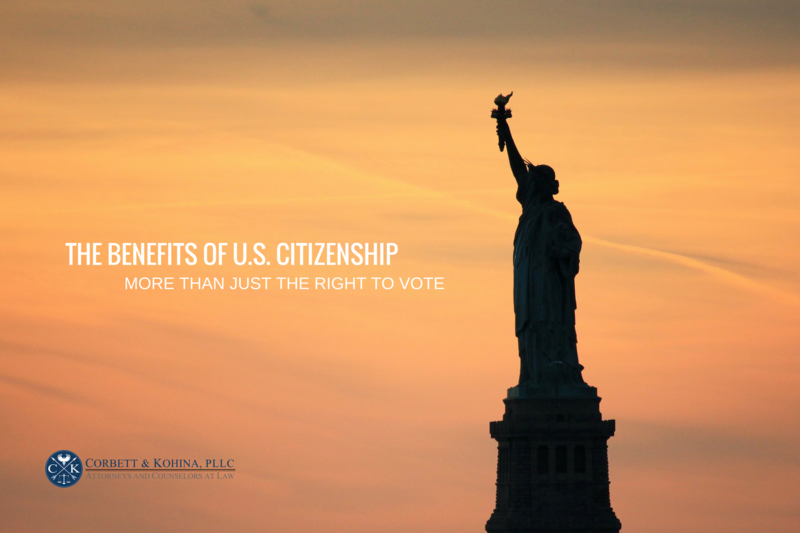 The purpose of the question is to determine whether you are ineligible for naturalization because of certain political activities, such as membership in communist or pro-communist organizations. Part 12 Question 12-14: People who have ever engaged in any of the activities listed such as genocide, torture, extrajudicial killing are generally not admissible as permanent residents and are permanently barred from demonstrating good moral character required for naturalization. If you lie on the naturalization application about your involvement with this activity and the government discovers your involvement, it can be a basis for the government to take away your U.S. citizenship (denaturalization) and deport you. 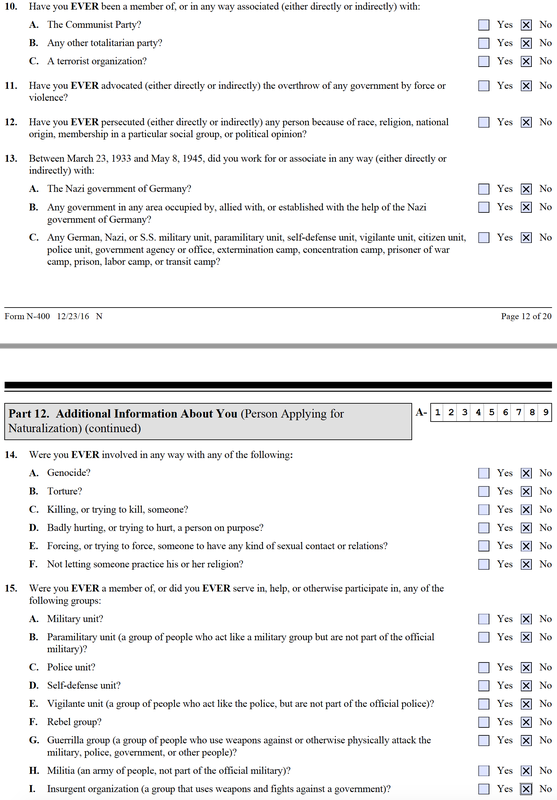 Part 12 Question 15: USCIS asks this questions in order to prevent people, who have engaged in acts of genocide, war crimes, torture and other prohibited activity from obtaining U.S. citizenship. Serving in a foreign military or otherwise participating in one of the groups listed in Question 15A through 15I does not automatically mean that you will be denied naturalization. 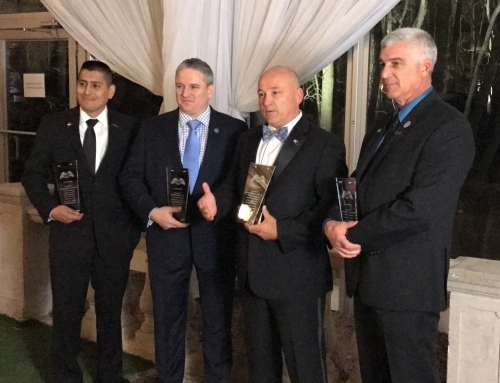 There are legitimate reasons for serving in the military or in the police, such as mandatory military service requirements in some countries such as Russia, Switzerland, Turkey and Israel. 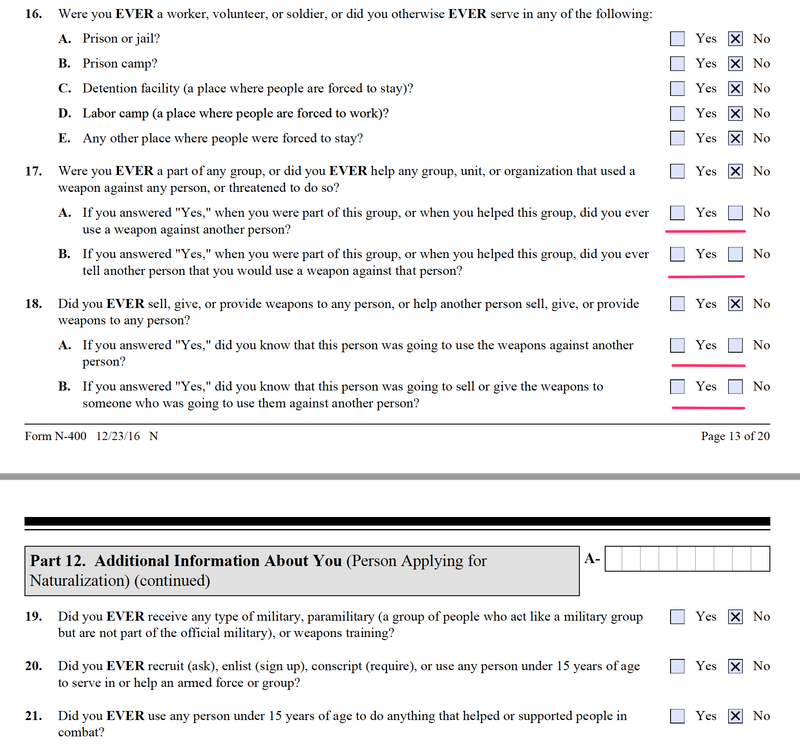 If you respond “yes” to any of the questions asked in 15A through 15I, then you must provide with your application a written explanation of your involvement with the group. Questions 16 through 21 look to identify people who were involved in human rights violations. It is not against the law to work at or serve in a prison, jail, or detention facility or receive military training. Therefore, answering “yes” to questions 16 through 21 does not automatically mean that you will be denied naturalization and placed in deportation (removal) proceedings. 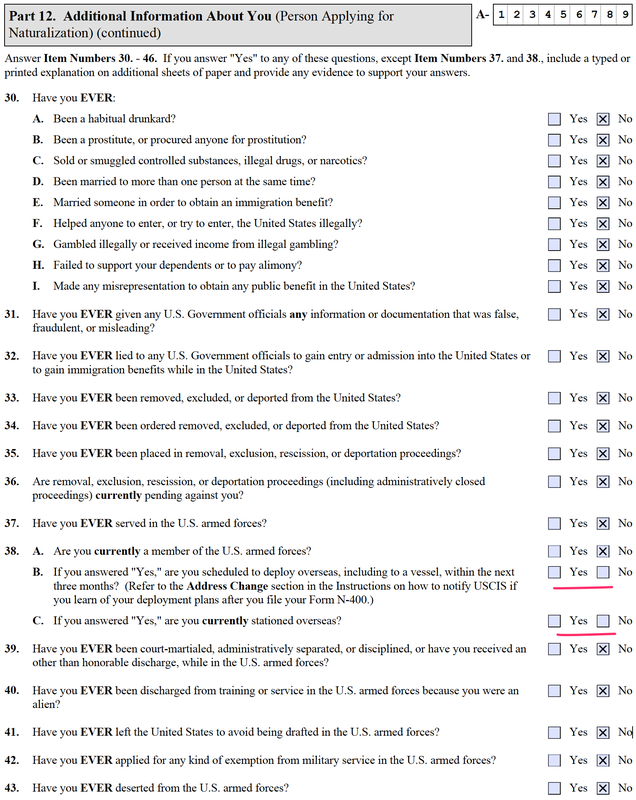 However, if you were involved in human rights violations, terrorist activity or other illegal activity while working at or serving in one of the facilities mentioned above, then you might be prevented from demonstrating good moral character required for naturalization and you might be deportable. 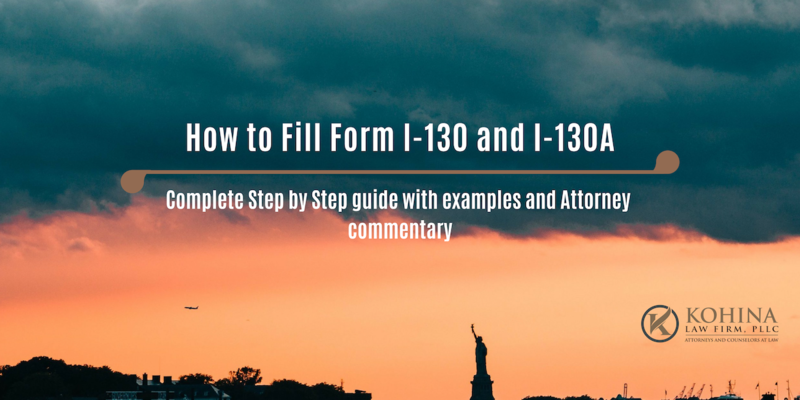 Part 12 questions 22-29: Even if you were never arrested or convicted of a crime but have committed, assisted in committing, or attempted to commit, a crime or offense you might be ineligible for naturalization. Talk to an immigration attorney if you have a criminal history.  Crime-related issues are a very complicated area of immigration law. If you have any questions on crimes you have committed or your interaction with law enforcement, or you answer ‘Yes’ to any of the above questions, talk to an immigration attorney. 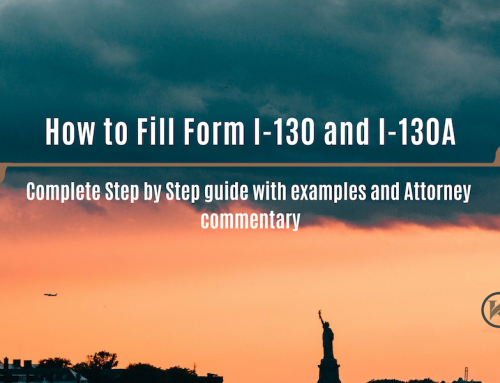 Part 12 questions 30-36: If you answer “yes” to any items from Questions 30 through 36 you might not be able to prove good moral character required for naturalization. 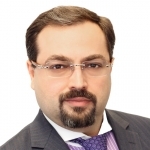 USCIS might deny your naturalization application. If you answer “yes” to any of these questions, provide a written explanation and provide any evidence to support your answer. 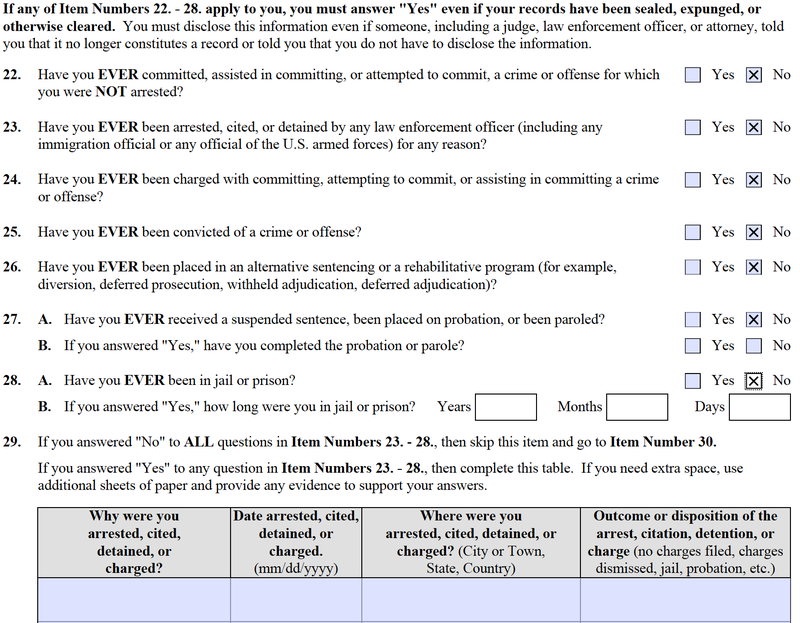 Part 12 questions 37-43: If you served in the U.S. Armed Forces, USCIS will check your Armed Services records as part of their investigation into your background and character. You will need to submit Form N-426, Request for Certification of Military or Naval Service with your naturalization application. There is no extra fee for these forms. For further assistance, contact the Military Helpline at 1-877-CIS-4MIL (1-877-247-4645) or visit www.uscis.gov/military. Part 12 question 44: DHS may interpret knowing and willful failure to register for military selective service as establishing lack of attachment to the Constitution of the United States. 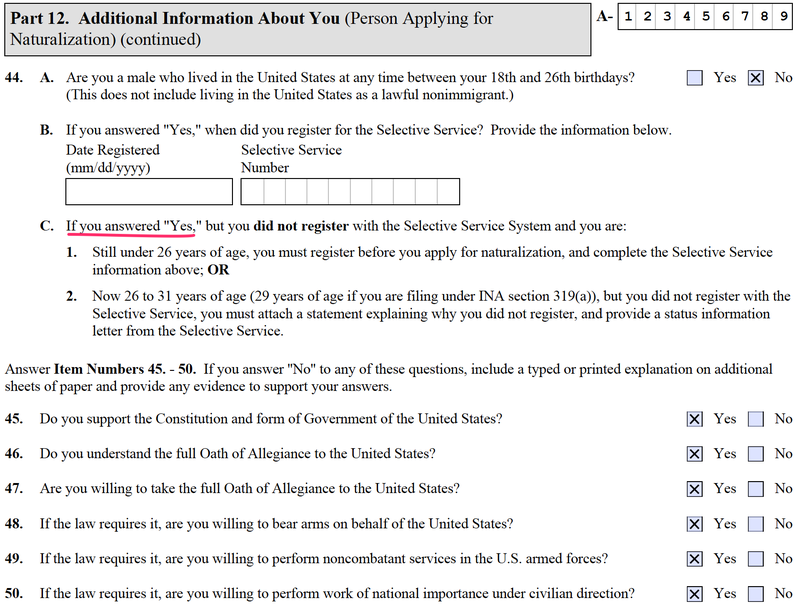 Male aliens between the ages 18 and 26 living in the U.S., whether documented or not, are required to register with the Selective Service System (SSS) The requirement ends once the applicant reaches the age of 26. The registration requirement does not apply to men here in lawful nonimmigrant status, such as F-1 student or H-1B temporary worker. Failure to register is a crime and can disqualify one for numerous government jobs and benefits, including immigration benefits. If you registered with the Selective Service System, but you do not know your registration number, you can get your number online or by calling or writing to Selective Service. Call their toll-free number at 888-655-1825 or check their website at www.sss.gov. An alien between ages 18 and 26 who has failed to register can cure the problem by registering with the Selective Service System before filing a naturalization application. 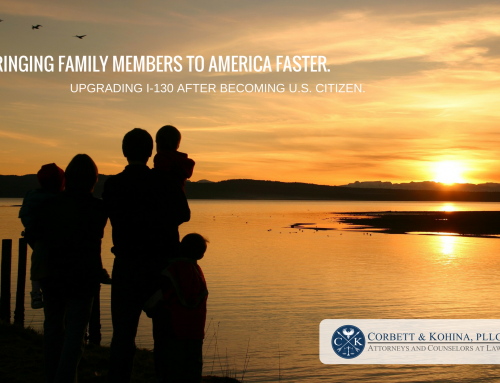 If you are 31 or older at the time you file form N-400 (or 29 or older under the rules for the spouse of a U.S. citizen), you can naturalize even if you failed to register. 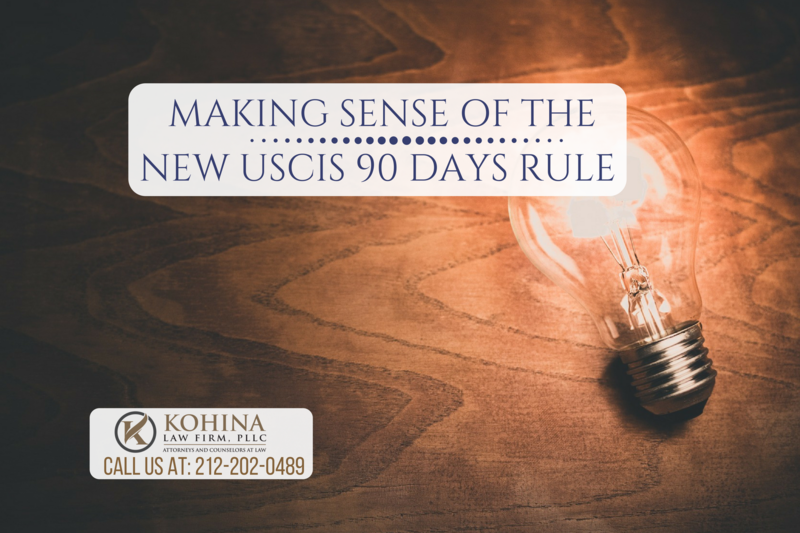 Though form N-400 says that you must submit documentation about your failure to register, USCIS does not require it from applicants who have turned 31. 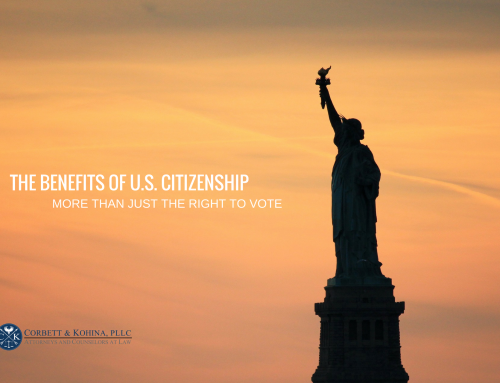 An applicant between the ages 26 and 31 is given the opportunity to show he did not knowingly or willfully failed to register and can nevertheless sometimes naturalize. You must submit a letter explaining why you did not register. If you are claiming that you were unaware of your obligation to register, you must also submit a Status Information Letter from Selective Service stating that the agency never contacted you. You can submit the explanation letter and the Status Information Letter either with the naturalization application or at the time of the naturalization interview. The Selective Service System will issue a “status information letter” reflecting the absence of a record that the alien avoided service. Instructions for requesting the Status Information Letter are online at www.sss.gov/instructions.html. Many applicants in this situation simply wait to age 31 to apply for citizenship. Part 12 questions 45-50: If possible within the bounds of honesty and conscience, the applicant should answer “yes” to these questions to avoid undesirable complications and potential ineligibility. If question 47 must be answered “no,” a well-reasoned and well-supported justification on religious grounds should be provided after careful research. A person who has a genuine religious objection to military service may take a modified version of the oath. USCIS has waived the oath requirement for children younger than 14.